Gene Baur is a perfect example of someone who cares about animals. He is an author, president and co-founder of his farm, Farm Sanctuary. His website tells all about his animals and some of his events he runs, such as, him speaking at other places. What he does to help the animals is he rescued animals in the need of help. He is also vegan. That means he doesn’t eat animal meat or animal by products including dairy. He talks in public about things such as current trends in the burgeoning food movement. Many websites help him reach the goal to expand his wish for his farm and his website. He shines lights in the dark corners of North America’s diet that leads to burgeoning’s bad health and toxic conditions for animals and humans. Another time he was talking was to a crowed about his story. Afterwards, there was a dinner in Gene Baur’s honor. One of his interviews had to do mostly with his farm and farm animals. He talked about what sense his farm has. In another, he talked about how to make America’s school lunch, "make the grade. " Not only is he an author, co-president of his farm but, he is also a runner. Gene describes that while he runs in nature he feels energized by it. That really shows how big he is of an animal lover. He says that while he runs, he thinks about human’s place in nature. He really is an animal and a nature lover. Hornbills are found in tropical and subtropical Africa, Asia and Melanesia. The helmeted hornbill is the largest of the birds within the hornbill family. These birds get part of their name from the helmet-like shape perched on the upper part of their bill. Males fight each other for territory by ramming into each other with their “helmets”. The real name for the helmet shape is casque. It’s made of keratin, the same substance that comprises human fingernails and rhino horns. Many people know about the terrible threat to elephants and rhinos who get poached for their valuable tusks, but not much is said about how endangered this bird is for their poached "helmets", so fewer people are aware of the threat to their existence. They are protected in China and on the endangered list, but it's not doing much good because it doesn't stop the illegal trade. 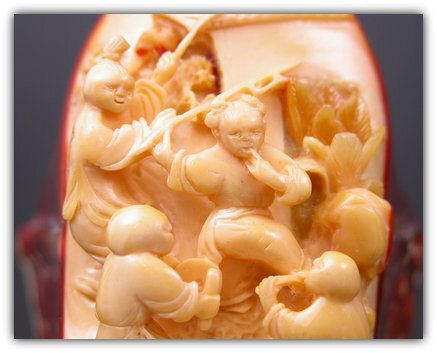 It's interesting that China's desire and demand for “hornbill ivory” or "golden jade" as it’s called, is nothing new. 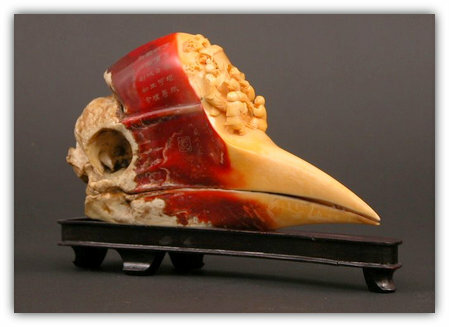 Since before the Ming Dynasty, hornbills have been used for carving. 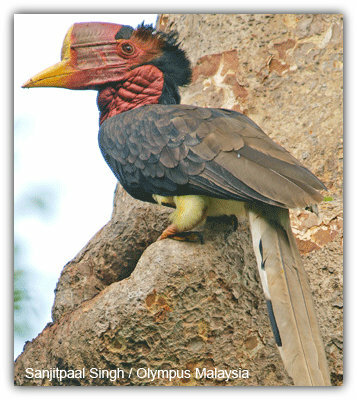 What makes this particular hornbill unique out of the other nearly 60 hornbill species is that their casque is solid instead of hollow. It is so prized as a source of carving material for jewelry and trinkets that it is worth five times that of elephant ivory. Demand is increasing over recent years and it’s driving these magnificent birds very close to the edge of extinction. Another threat to the helmeted hornbill birds is the need for a healthy tropical forest to live in, yet these forests are rapidly disappearing. ".. hornbills need large areas of forest to find enough fruit to sustain themselves. In the process, the animals provide an invaluable service to many tree species: transporting the seeds contained within their fruit far enough away from the “mother tree” that they can germinate. " where they came. Never buy trinkets or sculptures made from hornbills, elephants, or rhinos. These unusual birds make very human sounds. People often describe it sounding like someone laughing hysterically. They eat mostly fruit, especially figs, but they also eat insects. There’s a leathery wrinkled patchy part on their throat; blue for males and red for the females, but the rest is mostly covered in feathers. The people of Borneo practice a sect of the hornbills, that are considered "messengers of the spirits and symbols of virility". The Senufu people of Africa consider the hornbills as a messenger of "the supreme god" and a "symbol of fecundity". The people of Punan believe that a giant helmeted hornbill guards the river between life and death. Like all of our magnificent creatures that are threatened with extinction, our greatest hope to help them is through education, awareness, and love. How can we help helmet hornbills and the environment at home? 1. We need to teach ourselves more about what is going on with these birds. Look up more about what is happening to their habitats. 2. We can help by not throwing things on the ground like plastic bottles and cartons. Instead throw it in the recycle bin and help the planet too! 3. We could try viable and biodegradable products...also by never buying products made from endangered animals! 4. Another way to help the environment is to turn your lights off and go outside. Maybe while you're outside you can start a group in your community to raise money to help save the endangered animals. 5. Never buy ivory - old or new. It creates a demand every single time you buy it. Demand is what drives supply. Also, never buy something made with rhino horns or from birds. 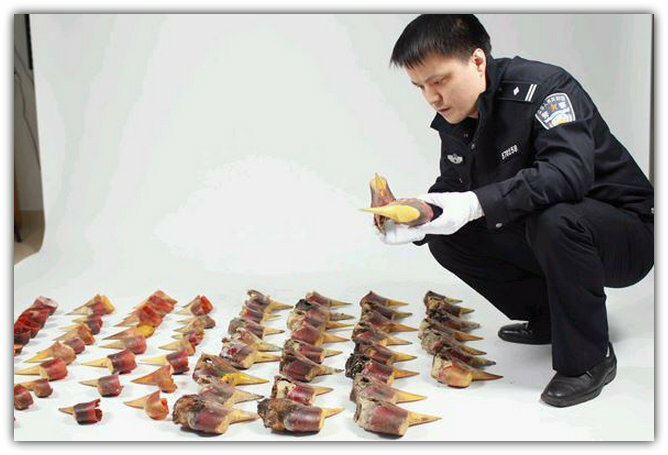 Gongbei Customs District had intercepted a precious animal product smuggling case at the beginning in 2013, in which 76 Helmeted Hornbill skulls were found in an inward passenger’s luggage. The passenger, a Yu, was sentenced to 5 years in prison and fined RMB 20,000. Full article. "I have yet to find a better feeling than making an animal feel good. And there's something deeply fulfilling about knowing that, even in a complicated and often unkind world, you've managed to create a pocket of perfect security and bliss for at least one small creature." A lot of people say animals are dumb and don’t feel things, but I completely disagree. I know animals feel and think. Some animals are probably smarter than some humans even; I mean if you look at some people this will make sense. My animals are pretty much my world. There's never been a time in my life that I can remember not having animals in the house. They've just always been around. Currently, I have two guinea pigs and one chinchilla and they're all very ornery and adorable. I've had Moe for about 4 1/2 years now. We got him when he was a baby. He’s very picky and only eats certain things; carrots, peppers, and spinach, and that's about it. He eats his guinea pig food but he's even picky with that too. He'll squeak every single morning on queue to get your attention to let you know it's time for his breakfast. He's very noisy and also very timid, but once you're holding him, he loves it when you rub his chin. I found Moe on Craigslist from a school teacher who couldn't keep him anymore. I found Squirtle, my other guinea pig, in a local pet store (not one of the big chain stores) and they get their guinea pigs from local, loving breeders. I got him when he was 5 months old. He has really developed a personality. Now Squirtle, unlike Moe, eats everything; spinach, tomatoes, cucumbers, you name it, he'd probably eat it. He's a little garbage disposal! He squeaks a lot for attention and when he does, it's very loud, but once you hold him he's all good. I can hold Squirtle and he'll just get all comfy under my chin and it just makes me so happy because he feels safe with me. I guess what I really love about animals is the fact that they're genuine and honest with you no matter what. Furby is my chinchilla. He is very ornery, but also will cuddle you if it's on his terms. He likes hay, apple wood sticks, and even pop tarts, but only every once in a while. He likes to jump around a lot and go really high and then falls down. Chinchillas are really fragile, so I get worried sometimes when he jumps too much. He likes to playfully nibble on fingers and also will bark if he doesn't get his way. Furby came from a friend of ours who found out they were allergic to chinchillas! These are my babies and they make me feel safe. They're all so full of energy and humor, and I love them so much. My pets have always been an important part of my life. 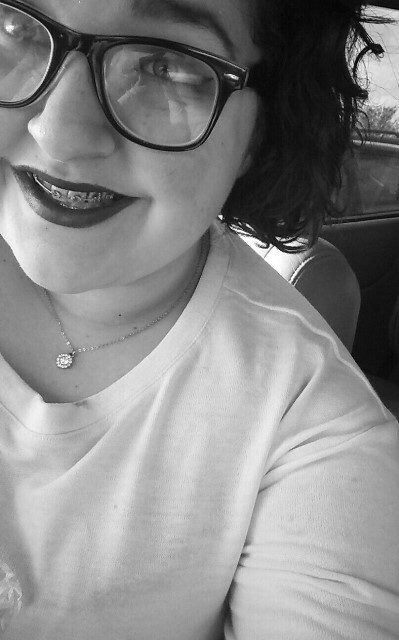 They’ve seen me at my worst and my best. They’ve been there to comfort me when I needed a friendly and understanding soul to talk to and hold. Some people have different reasons for wanting or having pets. For me, I guess it's the fact that my pets give me a purpose and a reason to get out of bed. They complete me and make me smile and laugh just to be around them. I have yet to find a better feeling than making an animal feel good. And there's something deeply fulfilling about knowing that, even in a complicated and often unkind world, you've managed to create a pocket of perfect security and bliss for at least one small creature. Unfortunately, there are people in this world who have no love or respect for animals. There are places where abusing helpless animals goes unpunished, such as China, where abusing animals on fur farms is legal. China is “the world’s largest fur exporter, supplying more than half of the finished fur garments imported for sale in the United States.” (source) The animals abused in that country include chinchillas. How can people do such things to small, helpless animals? in high school. I've been homeschooled my whole life and I really enjoy it. I'm an artist and a writer, I like to draw just about anything I see and write fiction stories and poetry. of animal rights and the need for a healthy environment. I try to do that every day. too. I'm very avid about how I feel and hope some day I can help make a change.